The sun came out this morning and the temperature shot up. Now almost all of our snow is gone except some slush pack on our mile-long driveway that’s kind of ugly. But, luckily, it’s still freezing at night so it’s passable in two-wheel-drive. 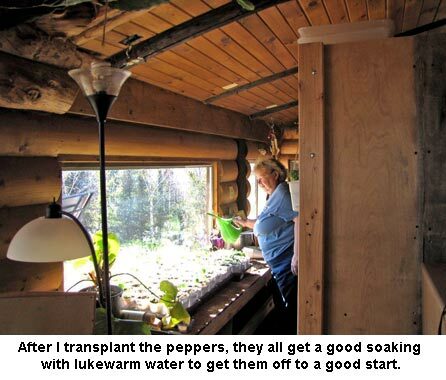 I’m in the middle of transplanting our peppers and that’s going nicely. I’ve been “scolded” for using non-sustainable Styrofoam cups for my transplants, which keeps the roots’ temperature even. But as I re-labled the cups, I noticed I’ve used some of them five or six times already! That’s pretty sustainable, in my book! And I should get several more years out of most of them. The tomatoes are mostly all up now and looking good. 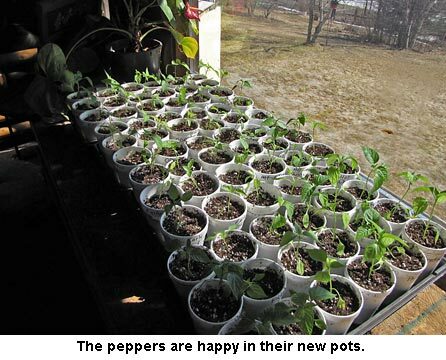 I’ll be transplanting some of them as soon as the peppers are all finished. Some of our seeds popped up in three days! They must be as anxious for spring as we are. We’re still working at cutting and splitting up all that firewood David and Will hauled home. Will and I did a full cord over the weekend, using up the big pile by the storage building. Today, he’s working at the HUGE pile farther up the driveway. And to top it off, as David works for Voyageur Log Homes, he sometimes brings home some log ends and pieces or heavy slab wood for even more firewood! Can’t have too much wood. It’s sort of like having “too much” food in the pantry, isn’t it? So GREAT to see those plants getting started and love that firewood. 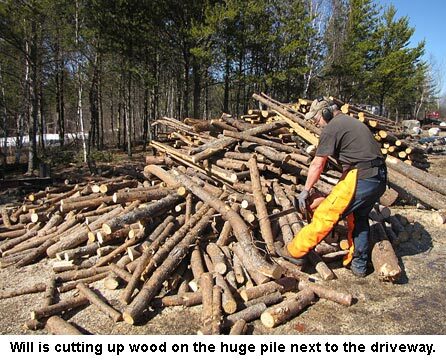 You’re right… never have too much firewood. Thanks for the update Jackie! That’s awesome firewood. No splitting needed. What a blessing.